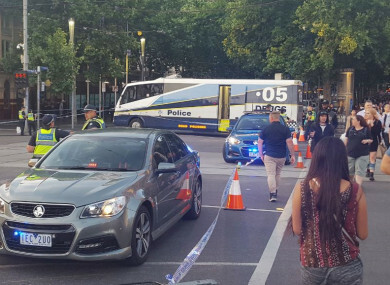 A MAN ACCUSED of driving his car into pedestrians in Melbourne has today been charged with 18 counts of attempted murder. Saeed Noori, an Australian citizen of Afghan descent, has a history of drug abuse and mental problems. He allegedly drove his car through a busy downtown intersection on Thursday, careering into tourists and shoppers. His motive is not clear, although police have said he made “utterances” to them about voices, dreams and the “poor treatment of Muslims” after his arrest. No link to any terrorist group has been found, authorities have said. “A 32-year-old man has been charged with 18 counts of attempted murder and one count of conduct endangering life,” Victoria state police said in a statement. Broadcaster ABC said Noori did not apply for bail when he appeared in court today, putting his head in his hands and becoming emotional when he saw his mother weeping during the short hearing. Of the 20 people taken to hospital after the incident, 12 remain there and three are in a critical condition. Nine foreigners were hurt, including three South Koreans, two of whom are fighting for their lives. A 25-year-old Irish woman was injured but is in a stable condition. The other people injured were from China, Italy, India, Venezuela and New Zealand. With a major carols by candlelight event scheduled for Christmas Eve and the cricket test between Australia and England taking place on St Stephen’s’ Day nearby, police have said they will be out in force. “Police are very well placed to do everything that is necessary to keep venues like the MCG (Melbourne Cricket Ground) safe and so many others that are going to be really busy over these coming days,” Victoria state Premier Daniel Andrews said. Thursday’s incident came almost a year after a car rammed into pedestrians in Melbourne’s busiest mall in January, killing six people. The driver, whose case is still being heard, was a drug addict who had allegedly just stabbed his brother. Email “Man charged with 18 counts of attempted murder over Melbourne car attack ”. Feedback on “Man charged with 18 counts of attempted murder over Melbourne car attack ”.